Probably the most common of all the panfish… the bluegill. Caught along shorelines almost anywhere, this fish is good eating. Being a smaller fish compared to some, hence the name panfish, it might take a few to make a meal. Whether you are camping, starving, or just like this particular fish, its abundance and pleasant taste make it fun and good eating. The crappie is another panfish that is good eating. Caught in the shallows in spring time, a stringer full of crappie will contribute to a great dinner. Delicate white meat makes this fish very popular for the table. With it’s distinctive yellow body and black stripes, the yellow perch is a stand out. If you are going to have a fish fry the yellow perch is a perfect choice. If you catch one perch, there are likely many more around. The channel catfish is an extremely popular and good eating fish. Lurking on the bottom of almost any lake or river, this fish can be caught on a variety of baits. Growling large enough for a couple of nice fillets per fish, a stringer full of these might require some room in the freezer. Similar to the perch, the walleye is a larger good eating fish. Often swimming close to the bottom, this fish can be caught with a variety of jigs and other similar baits. Although a little toothy compared to the perch, this fish is a keeper none the less. Walleye on your plate, and you are good shape. 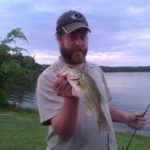 The yellow bass, white bass, striped bass, and hybrids are all good eating fish. Pictured here is a yellow bass. They are all similar with the striped bass being the largest and the yellow usually being the smallest. Filleted, battered, and fried, these fish are great on the plate.